The global ophthalmic ultrasound systems market is expanding due to the increase in prevalence of ocular disorders and diseases across the globe. The global ophthalmic ultrasound systems market was valued at US$ 2731.1 Mn in 2017. It is projected to reach a value of US$ 4443.3 Mn by 2026 and expand at a cumulative annual growth rate (CAGR) of 5.1% from 2018 to 2026. The global market is expanding at a relatively higher growth rate owing to the increasing geriatric population. Ultrasound devices are precisely utilized as a diagnostic device tool for ophthalmic treatment procedure. Ultrasonography can be made by either A-scan, B-scan or combined scan, such as A/B-scan, A-scan, and pachymeter. B-scan offers two-dimensional cross-sectional view of the eye as well as the orbit, while A B-scan is used on the closed eyelid to view the eye. Diagnostic tools are helpful when there is difficulty in examining the eye normally. Increase in cataract and ocular disease among the geriatric population, demand from ophthalmologist for new technologies, and the advent of high frequency transducer or probes are anticipated to drive the market during the forecast period. The global ophthalmic ultrasound device market has been segmented based on product, modality, end-user, and region. Based on product, the ophthalmic ultrasound systems market has been classified into A-scan, B-scan, combined scan, pachymeter, and ultrasound bio microscope (UBM). In terms of product, the A-scan segment accounted for a key share of the global market, in terms of revenue, in 2017. The combined scan segment is estimated to expand at an exponential growth rate during the forecast period. The segment is estimated to gain significant market share by the end of 2026. In terms of modality, the ophthalmic ultrasound systems market has been segregated into portable and standalone. The portable segment is expected to expand at a significantly high CAGR from 2018 to 2026. Availability of new and innovative devices in the market and increasing preference for portable devices are key factors responsible for the high growth rate that the segment is likely to register from 2018 to 2026. In terms of end-user, the global ophthalmic ultrasound systems market has been split into hospitals, eye research institutes, ambulatory surgical centers, and ophthalmic clinics. The hospitals segment accounted for a leading share of the market in 2017. Adoption of new generation ophthalmic ultrasound platforms, such as ‘Compact Touch’, is likely to drive the segment. Ophthalmic eye test cost, change in environmental conditions, frequent visits of eye patients, and modern technology are driving the ophthalmic clinics segment. In terms of region, the global ophthalmic ultrasound systems market has been segmented into North America, Europe, Asia Pacific, Latin America, and Middle East & Africa. North America dominated the global market in 2017. It is projected to lose market share by the end of 2026. The market in the North America is primarily driven by the rapid increase in diabetes and geriatric population in the U.S. Moreover, increase in demand for innovative ophthalmic ultrasound devices in the U.S. is projected to fuel the active ophthalmic ultrasound systems market in the country during the forecast period. The market in Asia Pacific is projected to expand at a rapid pace during the forecast period. 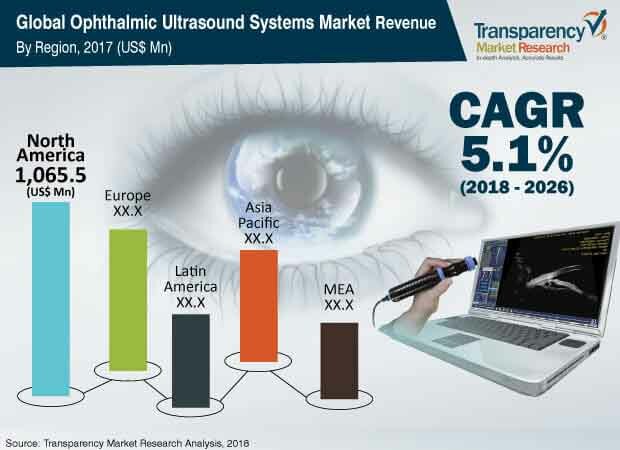 In Asia Pacific, China dominated ophthalmic ultrasound systems market, while the market in India is estimated to expand at an exponential CAGR during the forecast period. Companies such as Ametek, Inc., Carl Zeiss Meditec AG, Halma plc, NIDEK CO., LTD., Ellex Medical Lasers Ltd., Quantel Medical (Lumibird), Optos plc (Nikon Corporation), Escalon Medical Corp., Appasamy Associates, and Micro Medical Devices, Inc. accounted for a major share of the global ophthalmic ultrasound systems market in 2017. Halma plc, NIDEK CO., LTD., and Quantel Medical (Lumibird) are key producers of ophthalmic ultrasound devices. More than 1,000 customers in over 100 countries are using their products. Nidek Co., Ltd. is a leading manufacturer of ophthalmic ultrasound systems with a significant market share and a diverse product portfolio. The company is focused on pursuing global business activities based on three fields: ophthalmology & optometry, lens edging, and coating. Nidek engages in the development of laser photocoagulators for treatment of retinopathy and glaucoma. Companies are adopting the strategy of acquisition and collaboration with parallel companies in order to improve and strengthen their geographic presence in the global market. In February 2017, Ametek, Inc. acquired Rauland-Borg Corporation to increase its strength in intelligent workflow technology solutions to hospitals and health care facilities. Ophthalmic ultrasound systems are the most fundamental diagnostic tools in ophthalmology. Ultrasound is the only means to obtain a crucial view of the posterior segment, when there is a dense cataract or vitreous hemorrhage in the eye. The ophthalmic ultrasound system utilizes a high frequency transducer, probe, and software to diagnose the eye with time-sensitive conditions such as retinal detachment, vitreous hemorrhage, and lens dislocation. Ultrasonography can be carried out either by A-scan, B-scan, or combined scan such as A/B-scan, A-scan, and pachymeter. B-Scan offers two-dimensional cross-sectional view of the eye as well as the orbit, while the A B-scan it used on closed the eyelid to view the eye. These diagnostic tools are helpful when there is difficulty in examining the eye normally. There might be lid problems that make a routine examination difficult, such as edema or tarsorrhaphy or severe cataracts and keratoprosthesis. Ultra Bio Microscope (UBM) is another high definition ultrasonography process that allows assessment of anterior segment structures. Increase in cataract and ocular disease among the geriatric population, demand for new technologies from ophthalmologist, and advent of high frequency transducer or probes are anticipated to drive the market during the forecast period. A key trend of acquisition and collaboration of related companies to increase geographic presence has been observed in the last few years. For instance, in April 2016, Halma plc announced the expansion of its ophthalmic diagnostic device business in China. In December 2017, Halma plc acquired Argus Security and its UK distributor, Sterling, in order to consolidate its position in the infrastructure safety sector in Italy. The global ophthalmic ultrasound systems market has been segmented based on product, modality, end-user, and region. Based on product, the ophthalmic ultrasound systems market has been divided into A-scan, B-scan, combined scan, pachymeter, and ultrasound bio microscope (UBM). A-scan was a major segment of the ophthalmic ultrasound systems market, attributed to novel technological platforms, which rendered enhanced imaging reliability, accuracy, safety, and minimal post-operative pain with the adoption of minimally invasive surgeries. The combined scan segment is estimated to expand at an exponential growth rate during the forecast period. Consequently, the segment is estimated to gain significant market share by the end of 2026. In terms of region, the ophthalmic ultrasound systems market has been segmented into North America, Europe, Asia Pacific, Latin America, and Middle East & Africa. North America dominated the global market in 2017. It is projected to lose market share by the end of 2026. The market in North America is primarily driven by the rapid increase in geriatric population and high adoption of new device in the U.S. The market in Asia Pacific is projected to expand at a rapid pace during the forecast period. In Asia Pacific, China dominated the ophthalmic ultrasound systems market, while the market in India is estimated to expand at a prominent CAGR during the forecast period. The report also profiles major players in the market based on various attributes such as company overview, financial overview, SWOT analysis, key business strategies, product portfolio, and recent developments. Major players operating in global ophthalmic ultrasound systems market include Ametek, Inc., Carl Zeiss Meditec AG, Halma plc, NIDEK CO., LTD., Ellex Medical Lasers Ltd., Quantel Medical (Lumibird), Optos plc (Nikon Corporation), Escalon Medical Corp., Appasamy Associates, and Micro Medical Devices, Inc.